​​This image was inspired by a walk along Thompson Falls in the Blaeberry area. My husband and I were doing a hike along the falls, the creek was windy, the flow of the water was serene and the pasture was beautifully dotted by colourful wild flowers. 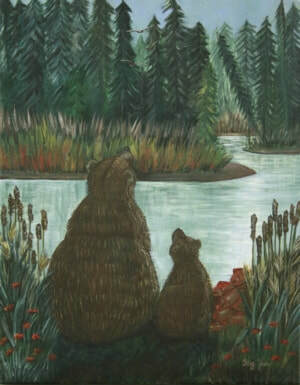 The next morning I decided to paint a couple of bears and placed them in the same beautiful scenery I‘d seen the day before. I painted a mother and her cub with their collection of fish they had caught. Tired from feasting on their lunch, they decided to take a well deserved break. As they were resting, three birds flew by and caught their attention. Surrounded by nature’s beauty and a lucky day of fishing, it really had been quite a day for them!